The Kroeker lab is examining the seasonal dynamics of benthic assemblages across the range of Macrocystis kelp forest ecosystems in North America - from Baja California to Southeast Alaska. By measuring the key environmental conditions, including temperature, ocean chemistry, nutrients and light, as well as ecological rates, such as primary productivity and consumption, at a variety of locations, our research aims to tease apart the relationships between multiple environmental drivers and ecological processes. This research is providing insight into the underpinnings of kelp forest ecosystem dynamics and the functional consequences of accelerating environmental changes. Beyond modeling the drivers of ecosystem dynamics in the field, we are also investigating how the diverse, multi-species assemblages of each field location respond to manipulative laboratory experiments (e.g., exposure to future ocean acidification scenarios). This design allows an exciting examination of the ecosystem dynamics at the leading edge of range shifts, where ocean acidification is likely to limit the temperature-driven expansion of many species. 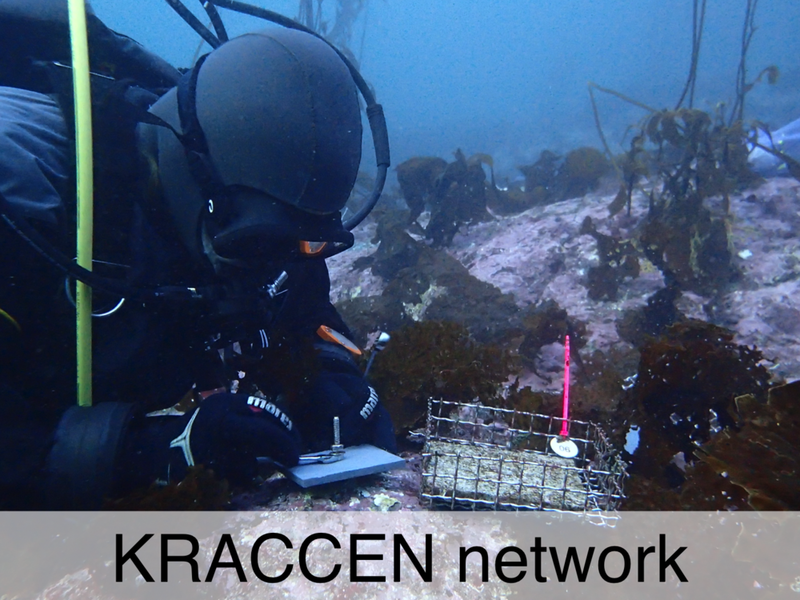 The spatially-extensive KRACCEN network will provide crucial insights into the linkages and feedbacks among multiple environmental drivers on ecosystem function in giant kelp forests throughout their range. In collaboration with Reef Check CA and the Monterey Bay Aquarium Research Institute (MBARI), the Kroeker lab is deploying oceanographic sensors to monitor pH, temperature, and dissolved oxygen in kelp forests from Van Damme, CA to Ensenada, Mexico. This project utilizes the bandwidth of a citizen scientist diving organization to collect high-quality and high-resolution data on oceanographic conditions along the California coast. This work hopes to provide insight into the dynamics of climate change along our coast and inform future models integrating citizen science programs with academic scientists. Global change can produce striking shifts in marine communities and ecosystems, yet our understanding of the mechanisms underlying these shifts is limited. Species interactions have the potential to mediate climate-driven changes in communities, and trophic interactions may be especially influential given their potentially cascading effects on community structure. By conducting a meta-analysis, the Kroeker lab is quantifying the individual and combined effects of ocean acidification and warming on predator-prey and herbivore-resource interactions. We are also characterizing the remaining variance in response among underlying studies according to the taxonomic groups and life-history stages of organisms examined, as well as key components of experimental design. 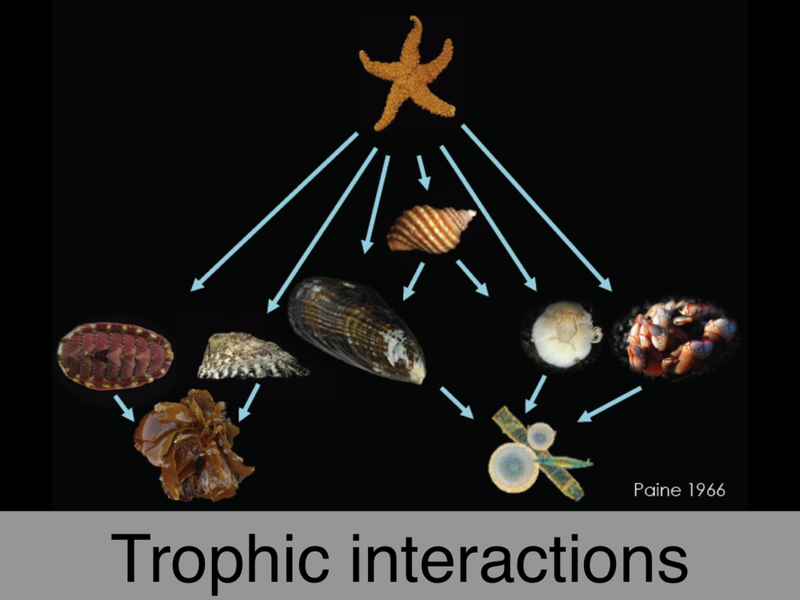 Overall, this work will evaluate the generality and robustness of our current predictions of the emergent effects of global change on trophic interactions. The balance between energetic gains (consumption) and energetic costs (metabolism) mediate the flow of energy through trophic levels and are crucial to maintaining ecosystem function. Therefore, a mismatch between the scaling of consumption and metabolism due to global change stressors could impact ecosystem stability. We are utilizing laboratory mesocosm experiments and field assays to assess the impacts of pH and temperature on consumption and metabolism of key kelp forest invertebrate grazers. Some of these grazing species, such as sea urchins, are known to play important roles in structuring kelp forest ecosystems and therefore changes to energetics could have cascading effects on reefs. We are working with The Nature Conservancy and Hog Island Oyster Company to design a scientifically rigorous monitoring program than can document trends in eelgrass growth, as well as eelgrass-aquaculture interactions in the Tomales Bay operations of Hog Island Oyster Company. This project allows the team to study human-eelgrass interactions, by examining the impacts of aquaculture on eelgrass cover and density, and documenting ecological shifts associated with changes in eelgrass ecosystems. Ideally, results will assist in elucidating actual versus perceived environmental effects of shellfish culture on eelgrass habitats and estuarine processes, which will aid managers in the decision-making and permitting process involving shellfish aquaculture and facilitate more sustainable aquaculture practices. This can streamline permitting for both agencies and industry, and enable each to focus efforts appropriately on conservation. Additionally, our lab is pairing surveys with unmanned aerial vehicles (UAVs) and traditional SCUBA surveys to test the applicability of UAV surveys in monitoring the extent and density of seagrass beds. Ultimately, we are interested in understanding whether UAV surveys can be a cost-effective monitoring methodology for government agencies and stakeholders. Recent research has found that the exposure of fish (and some invertebrates) to near-future ocean pH levels can result in changes in behavior such as larval homing, boldness, and response to predator and alarm cues through impaired cognitive function. However, the majority of this work has been conducted on tropical damselfish species and is limited to measuring the response of a species at the physiological or organismal level. Using mesocosm studies and behavioral assays, we are investigating the effect of low pH on a temperate surfperch species, Embiotoca jacksoni. We are exploring how effects of low pH on cognitive function and behavior may scale up to community-level changes in ecosystems by monitoring changes in ecologically important behaviors like foraging, which may impact predator-prey interactions. Additionally, coastal ecosystems can experience naturally variable pH due to oceanographic processes like upwelling, and we are investigating the role this natural variability may play in mediating the effects of future acidification. Recent work has focused on the impacts of ocean acidification on a variety of organisms, and efforts are now shifting to define strategies for coping with the issue. Seagrass ecosystems have been highlighted as important “OA refugia” for their potential to buffer acidified waters. Our research focuses on identifying the conditions under which seagrasses can serve to mitigate acidification in estuaries. In collaboration with local stakeholders, we are doing a series of deployments of high-resolution sensors (pH, temperature, salinity, dissolved oxygen) and ecological monitoring in estuaries across California. Our efforts will link and compare carbonate-system dynamics at whole-estuary scales to dynamics at the scales of individual seagrass meadows. We are also actively collaborating with other seagrass researchers in Oregon and Washington to enable comparisons at broad geographic scales from a variety of estuaries. Coralline algae occupy an important ecological role in nearshore marine habitats, providing chemical settlement cues for invertebrate larvae and complex calcified habitat for juvenile and adult organisms. As calcium-carbonate containing plants, corallines are considered highly vulnerable to dissolution under anticipated increases in carbon dioxide concentrations with ocean acidification. We are using laboratory manipulations and field studies to investigate the growth and physiology of these calcifying algae in the North Pacific, as well as anticipate how ocean acidification will impact their populations and high-latitude rocky reef communities. Southeast Alaska is the northernmost range for a variety of important grazer species, including pinto abalone. We are exploring how pinto abalone respond to seasonal changes in carbonate chemistry, as well as how their grazing behavior may change in future ocean conditions. Through analysis of abalone physiology and the nutritional content of key algal species, we hope to gain insight into how ocean acidification could affect northern abalone through their interaction with the algae they consume.